Orfix Ltd was established in 1994 in Raahe, Finland. It develops, manufactures and markets novel surgical implants for orthopaedics, traumalogy and hand surgery. 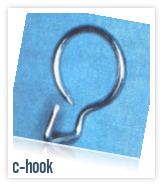 The C-hook is specially designed for acute acromioclavicular discolations. The easy insertion method decreases the required operation time. The C-hook allows early mobilisation and faster recovery after the operation. read more.. The implants are designed to ease surgical operations and to gain better results for patients. The company specialises in developing medical equipment and implants for the metallic biomaterial Nitinol, a nickel-titanium alloy with a unique thermal shape memory, superelasticity and high damping properties. These characteristics of Nitinol are vital when special solutions for special surgical cases are needed. Orfix Ltd is currently seeking a distributor for the EU market. Other kinds of partnership in marketing are also welcome. In addition, collaboration with a bulk producer capable of providing very high quality Nitinol would also be a desirable opportunity.